At Cox, we create positive environmental change by operating in ways that reduce our impact and inspire our employees, customers, suppliers and partners. As a company, we believe it’s important to be mindful of our energy consumption. Various locations have implemented advanced lighting, boiler and HVAC control systems to create significant energy savings. We are also looking for ways to improve the efficiency of our in-home equipment. In December 2013, we signed a voluntary agreement to improve set-top box efficiency. Cox already meets many of the energy savings goals set out in the agreement. Visit the CableLabs energy website at http://energy.cablelabs.com/cox to determine the typical energy consumption of our most popular set-top boxes. Several Cox locations benefit from alternative energy programs, including Arizona, California, Georgia and Rhode Island. 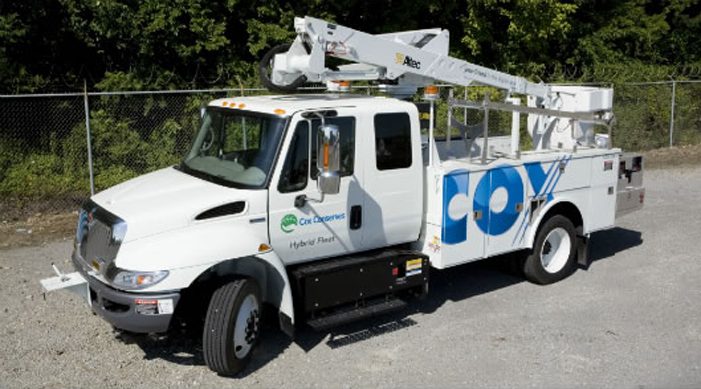 Cox operates one of the nation's largest and greenest fleets. 90% of network operations vehicles utilize a hybrid operating system and are zero emissions vehicles during aerial operations . Trimble GPS systems help save more than 1 million gallons of fuel each year. The Cox Conserves Heroes program, in partnership with The Trust for Public Land, honors individuals in California, Virginia and Louisiana who create, preserve or enhance public places for everyone to enjoy. Learn more about Cox Conserves Heroes at www.CoxConservesHeroes.com. In Arizona, Cox’s Project TWIG (Turning Waste Into Growth) began in 2008 as an effort to recycle waste that would otherwise wind up in trashcans and landfills. Project TWIG collects materials and sells them to recycling companies. Proceeds are given to local charities to fund grants for youth-oriented education and development programs.